Legendary British noise rock purveyors, RAMLEH, have announced their upcoming US West Coast tour dates for later this month, as the band makes a rare trip to the country in support of their latest double-disc album, Circular Time. Released in December via Crucial Blast, Circular Time sees RAMLEH closing a nearly twenty-year gap since the outfit's last "rock-oriented" album, and delivering their most intense work since re-emerging in recent years. Now comprised of founding member Gary Mundy, longtime member Anthony Di Franco, and new drummer Martyn Watts, the album sees the band returning with nearly two hours of speaker-shredding, void-gazing psychedelia, pushing the pummeling, Hawkwindian meltdowns heard on classic '90s-era albums. RAMLEH will now traverse halfway around the globe with a rare run of West Coast US tour dates this month. On this tour, the band will mix things up with electronic sets at half of the shows and rock sets at the others. 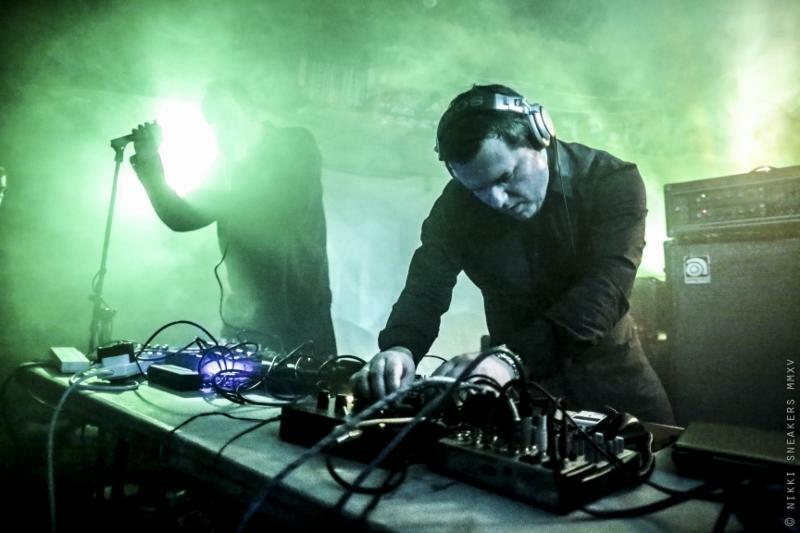 With four performances currently slated throughout California, RAMLEH will play an electronic set in Oakland on Wednesday, January 13th, a rock set in San Francisco on Thursday the 14th, and Los Angeles on Friday the 15th and Saturday the 16th - a rock set at the first and electronic set at the second. Co-headlining all four of these shows will be Gate, the avant noise rock project from Michael Morely of famed New Zealand group The Dead C. Stay tuned at the tour event page HERE and view the full list of confirmed performances below. A new video has also been released for Circular Time's sprawling track, "Re-Entry," which delivers the song in a dense and demented visual reality. The surrealistic and seizure-inducing video was edited and directed by Dominic F. Marceau and saw a recent premiere through Vice's music channel, Noisey. View RAMLEH's "Re-Entry" at THIS LOCATION, and stream the entire Circular Time album HERE. Circular Time is available in a six-panel gatefold jacket 2xCD and all digital outlets through Crucial Blast. The record can be ordered through the label's website HERE, Bandcamp HERE and iTunes HERE. The Quietus champions RAMLEH'snew album, offering, "Circular Time is a feast of a reward for those who have been waiting for this incarnation of RAMLEH to get its moment in the sun: a wild, celebratory, unrelenting epic of an album that at times..." Brainwashed reviewed the album, including, "Everything and anything I could have hoped for on a new release from RAMLEH can be found on Circular Time. The perverse psychedelia, the motorik rhythms, and the oppressive, noise heavy ambience all appears here, and hangs strongly with the band's previous records... Without a doubt on my short list for best albums I have heard this year." Heavy Blog Is Heavy dubbed the record with a 4/5 review, including, "Circular Times' double album status is due more to the album's length and the constraints of physical music mediums. On a thematic level, the album is a strong, consistent project that tampers with a sonic palette that will generally favor the interest of My Brother the Wind fans. Expansive passages of Can-esque guitar jamming, thumping jazz fusion bass lines and careful but poignant drumming stands firm as the core of RAMLEH's approach, which favors subtle repetition and development in the vein of Earth's recent output." The Grim Tower's excellent review offers, "Circular Time is like LSD without the blotter, it can simply take you on a journey without a real need for chemical substances of any kind; which I would consider to the be the generalized power of music... for a band that's been around for almost four decades, they're definitely showing that they've still got it."